Recently i took a task of replacing my stock case/AIO fans for something better and more quiet. As probably great majority of people i started browsing websites and sort fans by static pressure and airflow because that's what tells how good a fan is, right? You couldn't be more wrong. Thanks to some smart people on the internet i realised how big and massive mistake is it to even look at the CFM and mmH20 airflow and pressure specs listed on most of websites presenting PC fans. To spread awareness i made this post, in hopes nobody will ever make same mistake as me. - Maximum Static Pressure is measured when there is 0 airflow, meaning its situation when you put a fan flat on the table and force it to spin blocking all the air going out. And again, situation like that is completely unrealistic and has no real world use for PC fan, thus Maximum Static Pressure is completely useless. So, fan manufacturers are trying to lure you in to buy their products giving you useless information that has no impact in real life performance. What do we do now? What to look for? As you can see, at the left most side where the curves begin we have the "Maximum Static Pressure" that fan manufacturers love to list on their product pages. For that Pressure airflow equals 0 (test box is closed). After that the box starts being opened so airflow is releases (it increases) but due to bigger opening fan generates less pressure and it goes on like this until airway is fully open and air can flow without restrictions. Somewhere in the middle of the curve, we have an approximated "real life application", where for example a radiator is blocking about half of the air that blows into it while letting other half through. So what's the big deal? The big deal is that a fan with lower "max static pressure" can perform better than a fan with higher "max static pressure" as the curve is not linear. Just as you can see in attached example, where we come to the "real life" performance area the "weaker" fan shows better characteristic than the fan with bigger numbers. BeQuiet: no specification on first request, failed escalation, refuse to provide specification "we do not give that kind of information to externals"
- Do not trust the CFM and mmH2O numbers on manufacturers website (they are useless max values). - Do not compare fans by their max CFM and max mmH2O (again what manufacturer post). - Seek reliable fan tests with established testing methodology or contact manufacturers to provide P-Q curves for their fan products. Wow! And how long has this "P-Q curve" be out in the Public Eye? The lenght of P-Q is not that much important, as how "long" it is would gives us exactly same information as fan product pages, the lenght of PQ curve is maximum airflow and height is maximum Static Pressure. What you want to look at in the P-Q curve is the airflow and static pressure, somewhere in the middle of the curve, because that's the real life performance of a fan. 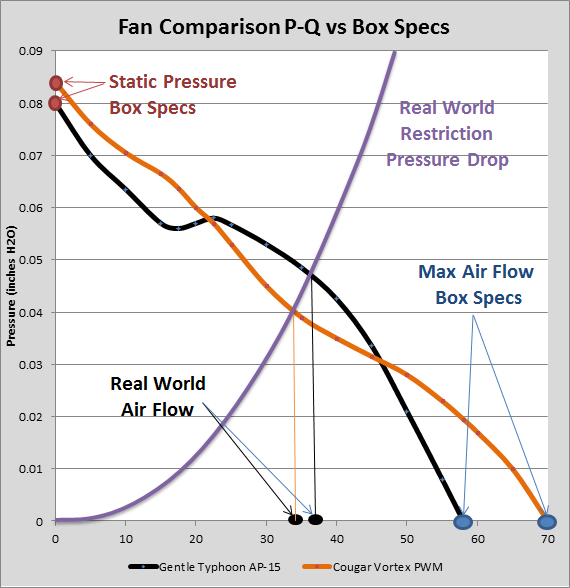 See the photo here https://martinsliquidlab.files.wordpress.com/2013/02/cougarvsgt15part4.png we discard the left/right hand max specs and instead look at the middle of the curve, and from there we take a note of fan real life airflow and using that middle of the curve airflow value we can somehow compare different fans (as long as different fans also have P-Q curve). Good info. I never purchased a fan solely based on its mfger specs. I usually went with trusted sources who tested fans, rads, pumps, etc. with the proper measuring equipment. Unfortunately some have moved on (Skinnelabs and Martinsliquidlab) while their info might be old, it's still relevant today and a great source of info. Nonetheless, I'm always on the look out for some benches. One that comes to mind and is around is ThermalBench. Thermal Bench is solid, a VERY knowledgeable guy runs it, I know him personally and tries to stay above playing favorites and just giving solid info. Don't recall seeing him to a P-Q curve but mention it to him, see what he says, might be something he would consider doing. Any chance of this being put as a sticky or linked too from the already stickied fan topic?